Did you know that the majority of Scotland’s woodland is actually plantation woods? Only a small percentage is actually native broadleaf woodland, and even less is ancient woodland. At the beginning of the last century woodland cover in Scotland had declined to about 5%. The introduction of a state reforestation programme in 1919 led to a steady increase but unfortunatly mainly through the creation of coniferous plantation. Today Scotland’s woodland cover is about 17% of the land area. This is still only about half of the average of other EU countries and less than one quarter of the woodland area that once covered much of Scotland’s land surface. For example, South Lanarkshire has a total of 31,580 ha of woodland cover, 84% of this is plantation woodland, mostly of commercial conifers. 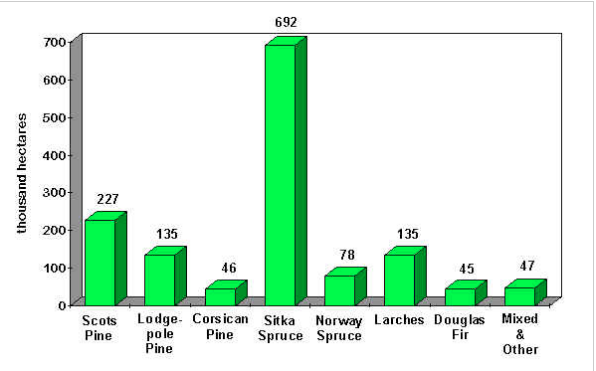 Conifer plantations were initially planted to produce an economic yield up to 6 times faster than broadleaf however the decline in commercial gain from plantation woodland over the last twenty years, due to poor quality timber, has shown that these short term yields have not been financially successful. There are traditional conifer woodlands in Scotland, these consist of Scots Pine, Juniper and Yew. However the only species remaining in any quantity is Scots Pine and these are isolated to the Highlands. While natural conifer woodlands are incredible sources of biodiversity it is well known that plantations create acidic soil and greatly reduce both plant and wildlife biodiversity and can be barren landscapes.